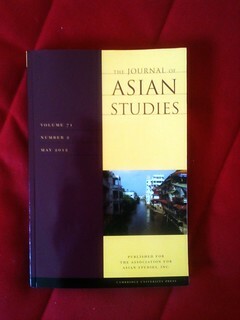 The Journal of Asian Studies, where I am an advising editor, published a photo I took on its cover of its most recent issue. It’s an image an image that I took in May, 2008 from a bridge overlooking the Sai River, which sits between Thailand and Myanmar. On the right are bustling tourist and trinket shops in the Thai city of Mae Sai. 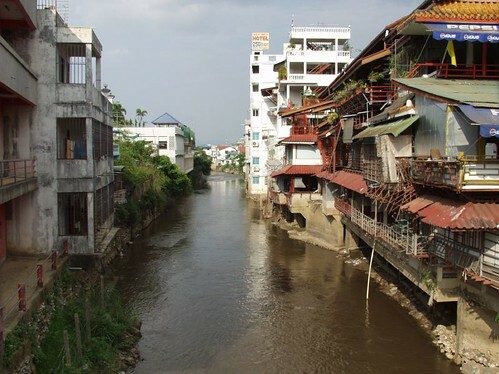 On the left are hollowed out buildings of the Myanmar city of Tachilek. You can cross the border from Thailand into Myanmar by foot by paying US$10 or 500 Thai Baht and leaving your passport with Myanmar officials until you re-enter Thailand. You can also find two essays on Myanmar in the May, 2012 issue of the Journal about the fascinating politics and history of that country. When people ask me about Thailand — particularly, if it is safe to visit — I tell them that the political turmoil that has plagued the country for several years has not amounted to violence. That story has, of course, changed. A friend told me that on her way to the airport in Bangkok on Tuesday, a group of people put shopping carts in the road, blocking the taxi in front of hers. They beat the driver with wooden bats as her own taxi driver swerved out of the way. Certainly, the time of peaceful demonstration, where power changes hands in bloodless coups and elections is over. Thailand’s protester-in-chief, Sondhi Limthongkul (above), was attacked by gunmen today. The Bangkok Post reports that the media mogul has survived the attack. He was injured by shrapnel to the head from over 100 rounds that were shot at his vehicle. Images of his injuries (left) were published in the Manager Daily, a newspaper Sondhi owns. Sondhi is a former journalist and owner of the major media company Manager Group. Once a close friend to former prime minister Thaksin Shinawatra, he is now the leader the People’s Alliance for Democracy, the principal group that staged huge protests and agitated for Thaksin’s ousting in a 2006 military coup. 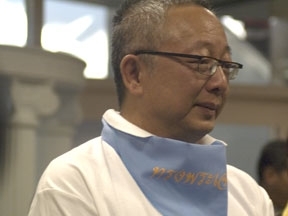 When Thaksin-aligned leaders were elected in 2007, Sondhi took centerstage again and led yellow-shirted protests that shut down Bangkok’s major airports. Sondhi’s agitation ended when the current Prime Minister, Abhisit Vejjajiva, was apointed, but Abhisit is now the target of pro-Thaksin red shirt protests which have devolved into riots and confrontations with soldiers at Bangkok’s busiest intersections. AM: What do you say to people who say that this new time journalism isn’t really journalism? SL: What makes them think that they are real journalism? Time changes, things change. New factors — how do you report news in a country which is completely non-transparent, in a country where semi- or unofficial censorship happens? How do you do it? How do you get the other side of the story? Let’s say you’re doing a story on corruption, all right? You’re doing a story on corruption and then you pose a question to the people involved, in charge, and they deny it. They say, ‘That’s not true.’ Are you going to believe in what they say, or are you going to go and dig in more? And once you go and dig in more, you’re going to find a lot of sources. And all of those sources are scared to death. They say, ‘Don’t quote me.’ Give me a reliable source who wants to withhold the name. Once those reliable sources who want to withhold the names happens more than two, three, four, five times, you begin to question, are they really your source? You see? So this is the dilemma. So each society, each country has different ways of doing things. People who are actually critical of what I’m doing are getting too used the way Western media has been displayed. Right here, you can go to the computer and punch some name on it. There’s some basic background or in-depth background coming up. Or you want to talk to the mayor on official record, the mayor will speak to you. But you want to talk to the mayor of Bangkok on official record, and they will say that’s not true. So it literally shut the door. So you have to go on your own. When you go on your own, you are acting like Spartacus because you have to roam around with no direction. You find somebody and you talk to them, and they look around, they look up, look down. Literally, when I fought Thaksin, my phones have been tapped. I’ve been using five phones. I mean, how could a prime minister tap my bloody phone? This is not happening here [in the United States]. Even though the Bush administration has asked Congress to give him the freedom to tap suspected terrorists — even at that statute, you guys were making a hue and cry. Look at me. My life has been threatened. There were literally assassination attempts on me. How do you explain this to some guy who is sitting by the Hudson River and writing a story? You guys are used to the rule of law. But there seems to be a rule of law, but only in names, in words, but not in action in Thailand. Thailand’s army chief has said that he believes no protesters have been killed as soldiers cracked down to end the current unrest. But the state of emergency continues in Thailand and reactions to the attempt on Sondhi’s life are still coming. In Jan. 2008, the Computer Crimes Act was about six months away from taking effect in Thailand. It was part of the Internal Security Act, a complicated series of laws that were passed just before the leaders of a military coup held elections to restore democracy to the country. In Bangkok, journalists and web entrepreneurs were worried. Their main concerns were, first, the vagueness of the law, and second, the requirement that Internet Service Providers, or ISPs, log web usage. In essence, the ISPs had to be able to report who was doing what and saying what online, but exactly what information was to be logged was unclear. No one was quite sure how the law would or could be applied, just that it was the kind of law that could be used quite easily for political rather than security purposes. Chiranuch Premchaiporn told me then that this scared her more than Thailand’s infamous lese majeste laws, which accord steep punishments for anyone who insults the King. If she was accused of lese majeste, Premchaiporn said with her ubiquitous smile, at least the King could pardon her. Premchaiporn is the editor of a pioneering news website, Prachathai. Today, her site reports that she was arrested and then granted bail for violating the Computer Crimes Act. According to the BBC and the Thai daily newspaper The Nation, police officers arrested her on Friday afternoon and confiscated hard drives from Prachathai‘s offices in Bangkok. Premchaiporn’s alleged violation is allowing lese majeste comments to appear on the site in discussion boards. She has reportedly been charged under Article 15 of the Computer Crime Act, which makes it illegal for anyone to support or consent to Internet posts that violate criminal codes or present a threat to national security. She faces a maximum sentence of five years imprisonment. A series of lese majeste charges filed in recent months have called into question Thailand’s committment to freedom of expression. Two weeks ago, an Australian author was pardoned after spending seven months of a three-year sentence in prison. Political scientist Giles “Ji” Ungpakorn left the country after being charged with lese majeste for his book about the 2006 coup. BBC reporter Jonathan Head (who inicidentally wrote one of the first English-language reports about Premchaiporn’s arrest) is currently facing three charges of lese majeste for comments he allegedly made to the Foreign Correspondent’s Club in Bangkok. Being charged under the Computer Crimes Act, however, presents different challenges than being charged with lese majeste because it has not yet been applied against individual news reporters. The law has been used so far most often against pornographers and to temporarily shut down websites, including YouTube and Prachathai. Two of Prachathai‘s web board users were arrested and then released in Aug. 2007 for comments they made about Thai royalty, but the government never brought charges against them. The Asian Human Rights Commission and the Committee to Protect Journalists have criticized the action against Premchaiporn and Prachathai as a threat to free expression. 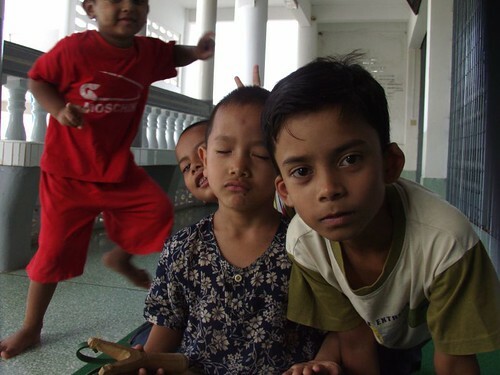 These are kids in Myanmar, also known as Burma. They live in a town called Tachilek, on the border of Thailand. I met them in a mosque — a very small mosque on a sidestreet in the town. There is a lot of dispute about the position and treatment of Muslims in Myanmar, a predominantly Buddhist country. I was happy to meet these boys — the one in the middle was particularly funny, meditating like a Buddhist monk but holding a slingshot in his hand. I don’t think they get many visitors. I had planned to visit Yangon (Rangoon) with my friend Anil Kalhan in the second weekend of May, which was incidentally the weekend of the country’s constitutional referendum. Not surprisingly (though, I have to say, I was still a bit surprised) the Myanmar Embassy in Singapore closed its visa section for a few days about a month before our weekend sojourn. And then for the week after that. And the next week too, which was when Cyclone Nargis hit. When we finally got to the visa counter (on now my fourth visit to the embassy) we were told that a visa could not be ready until Monday, the Monday that we were supposed to return to Singapore. So, our Yangon trip didn’t work out. Not to be deterred, we decided to take the back door to Burma. We went to Chiang Mai in Northern Thailand. We wandered around the city and met some people there who told us a lot about what was happening across the border in Burma. Then we went by bus to Mae Sai, the border town on the Thai side and our gateway to a country neither of us had ever seen but were very curious about. Tachilek and Mae Sai sit inside the Golden Triangle, the area where Thailand, Burma and Laos meet. It’s a place notorious for opium production, hilltribes and the spread of HIV. Not too pretty. But it’s also a place glossed over for tourists — these “dangerous” places have capitalized on their reputations in many ways. So too has Tachilek. The three-wheel taxi drivers have a little route they all follow, showing half-day tourists from Thailand Shan temples, Chinese-style temples and the beauty of the valley where Tachilek rests. 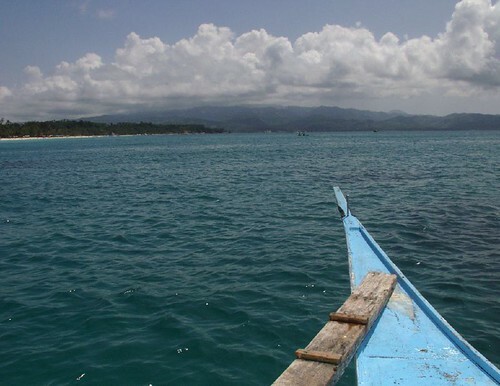 Indeed, it is a beautiful country, but one that is conspicuously void of newspapers. Many buildings have satellite dishes, but the televisions we saw were tuned to WWF wrestling from across the border. One week after Cycle Nargis hit, our guide still thought only a few thousand had been killed. So we wandered around, seeing all the things that all the curious onlookers see and trying to ask questions in between, It is certainly a strange place and one where you don’t speak too loudly, or walk past a polling booth twice, or take photos of referendum posters out in the open. Our guide made that abundantly clear to us. He also made it clear that people in Tachilek didn’t feel that their vote in the referendum was secret — so many voted “yes” to satisfy local leaders. So I took what photos I could — I’m afraid I couldn’t properly capture Tachilek, though.